Looks great George, can you give us a brief run down on how it functions? For example, I see no switches for step/reset selection, rather there appear to be pots that control whether the stage skips or resets. How does this work? Sure there is. There's a switch to the left of the stage 1 LED. Up is step, center is stop/reset and down is run. The pushbutton to the right of the stage 8 LED either steps or resets the stages based on the position of the switch. How does it work? Don't know. The design looks like it should. Reality...priceless. I'll know within a week. I'm going to design this using a panel component board sandwiched to a SMD PC board. There's a ton of parts and very little board space but, since 80% is digital logic..oh, well. I'll keep kit possibilities open when I'm designing it for the DIY guys. I may just leave the holes for the sandwich connectors open and you guys will have to do some soldering. IDK. Let me get a working unit first. Then, I'll worry about packaging. The CVA bus just provides around 0-3V for that stage. so, about 3 octaves at 1V/O. When a CVA stage is up past 80%, it "mutes" that stage. Actually, it just doesn't generate a gate on that stage and the LED is red to show that no gate is generated. The clock LED will also flash red during any muted stage. Otherwise, the clock and stage LED's are green. My VC LFO is my clock. At least the square wave portion. The Var bus is just the VC timing CV for that stage. If the Var row stage is below 20%, it skips that stage and goes to the next one. If it's up over 80%, it loads the start count into the counter. Stage one if running forward, stage 8 if running in reverse. CV B bus is just 0-3 V to Bus B. No position sensing tricks. I'll fill you in more once it's running on the breadboard. I did breadboard a single row, 8 stage step sequencer as a proof of concept circuit last year. Stephen was playing around with it in the following video. It's an Ichabod demo and you can't see the breadboard but, you can hear it sequencing. Thanks for the explanation George, I understand now how stage selection/reset thing works. It's quite different from any other sequencer I've encountered which have all used switches to determine which stage the sequencer reset at, which stages output gates etc. 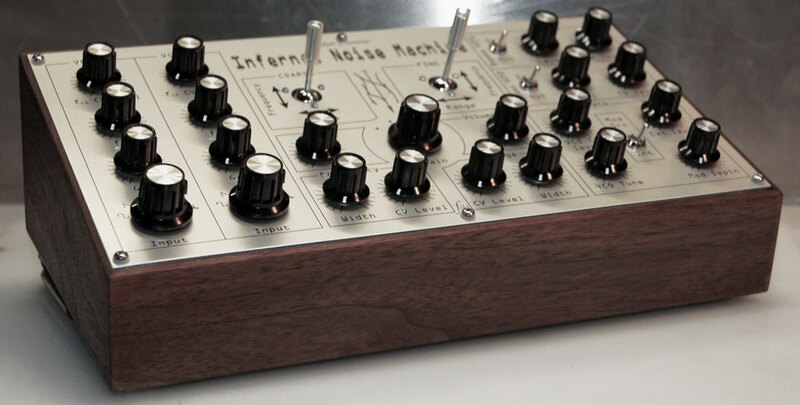 That does look like a nice compact yet powerful little sequencer. Keep up the good work! That's a fair point you raise there George! Looks like designing a custom 5u panel will be fun! Usually, I either get frustrated because a designed function doesn't want to work the way the textbooks said the electrons will act or, something really cool gets stumbled upon that turns into a really cool "Oh, I gotta do that" feature. Either way, this is the fun part of doing this stuff. Maybe an XOR function on your Utility 2 module could be used to switch between two sequencers, running simultaneously, for sequences longer than eight steps (thank you, STG, for explaining sequential switches in terms a chimp with ADD can understand). Well, theoretically, you can string them together. Look closely and you'll se an "Xout" and "Xin" jack. and have them run in series, parallel or some screwed up combination in between. I'll be able to evaluate it more once I get the prototype closer to about 90% operational. I had to take a break in order to build some orders. can't wait to see this board out! That's as current as it is. I got wrapped up in current biz and it fell on the back burner. I did get it breadbaorded. When my clock chip fried, I figured I need to strip it down and start over and not rush to put it all together. I haven't been back to it. Oddly, my older brother asks me if it's done every time he calls. He has no synths. He's just being an older brother. i wasn't trying to give you a hard time i was just referring to the actual link that you had up top (which i see has now been fixed). i clicked on it yesterday and it went somewhere else. then found the sequencer on your wiki. but i do crave more info when you have some! a mattson sequencer is gonna be exciting for lots of folks! It's going to be tough to do "through hole" and using connectors and wires to wire up the panel components. That's a lot of stuff crammed into a very small space. I'm leaning toward making a panel component board and have it mate with the circuit board and going SMT instead of through-hole. I have to get it functioning first. I'm also thinking of making a stand-alone version and doing the same with my MIDI/CV contoller and mounting them in boxes similar to the ones I made for Flight for his INM deluxe models. That way, I can add some additional functions that I didn't have room for on the main panels. Yep, the old link pointed to the old server which went away Sept 15.